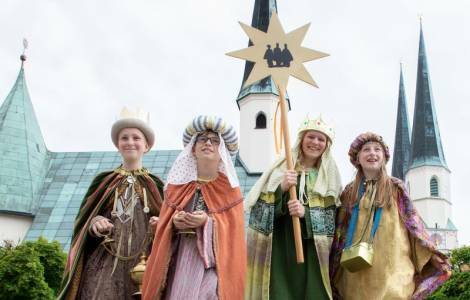 Aachen (Agenzia Fides) - More than 2,600 "Star Singers" (Sternsinger) of the Holy Childhood Association in Germany will participate today, Friday, December 28th at the official inauguration of their 61st Annual Campaign in Altötting (Germany) and the motto of the 2019 Campaign is: "Bring blessing, be blessing. Together next to disabled children, in Peru and all over the world",. Dressed in their costumes of Magi, with their Star and their songs during Christmas time and in the early days of the new year the "Star Singers" go around visiting German homes. About 300 thousand children from Catholic parishes in Germany will carry the "C+M+ B" blessing ("Christus mansionem benedicat - Christ bless this house") to the families, collecting donations for other children their age who suffer throughout the world. For their 61st campaign this year the Star Singers of the German Holy Childhood Association of the 27 dioceses in the country will pay special attention to children with a disability. "This is particularly important because it is a sad reality, in many countries of the world children with a disability are hidden from their families and do not receive any medical, social or psychological assistance", underlines Msgr. Klaus Krämer, National Director of the Pontifical Mission Societies (PMS) and of the German Holy Childhood Association. "It is important to fight fears and prejudices against the unknown in societies, so that these children can develop their talents. The Star Singers want to contribute to this commitment with their current Campaign". The annual campaign takes place mainly in German-speaking regions and in various European countries such as Austria, Switzerland, Italy (South Tyrol), Slovenia, Hungary and Slovakia, united in the European network of Star Singers. Star Singers groups from Austria, Switzerland, South Tyrol, Hungary, Romania and Slovakia will attend Mass with Pope Francis in St. Peter's Basilica, next January 1.